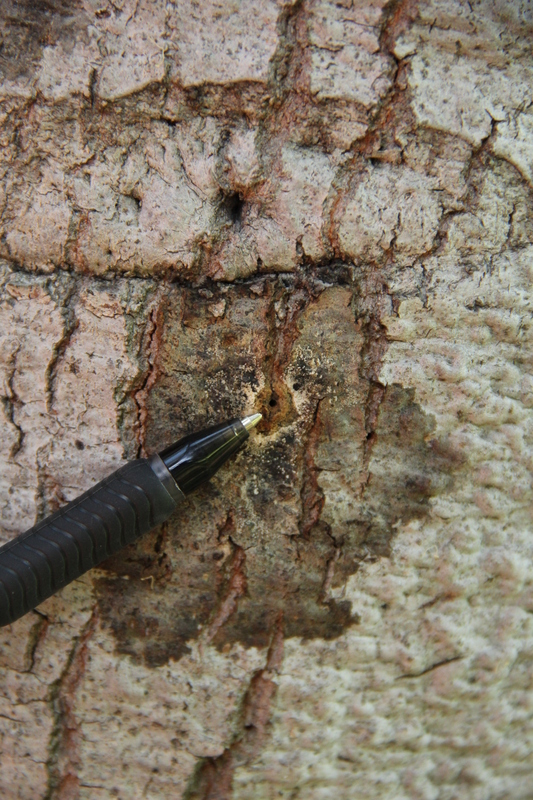 Because ISHB is just a tiny beetle which spends most of its life inside the tree, it can be difficult to find, let alone identify the beetle itself. 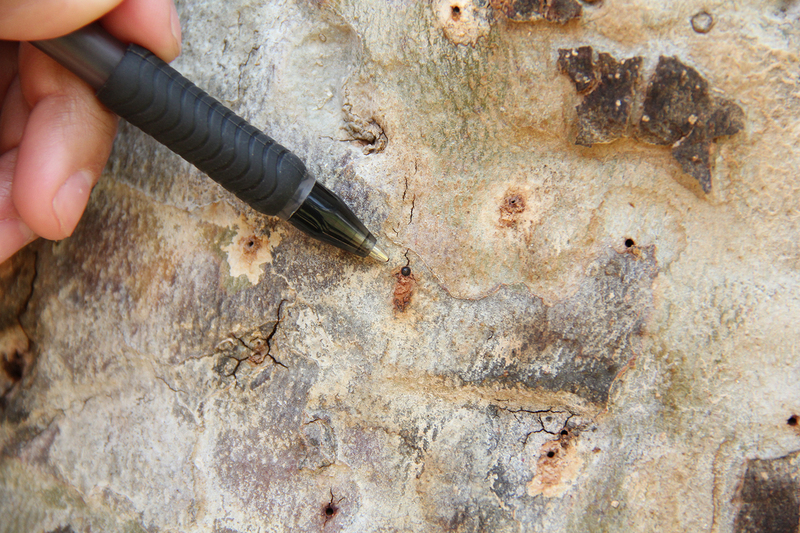 If you’re unable to find a ISHB beetle on the bark surface, start looking for small (ball point pen tip-sized), round entry-holes on the bark. 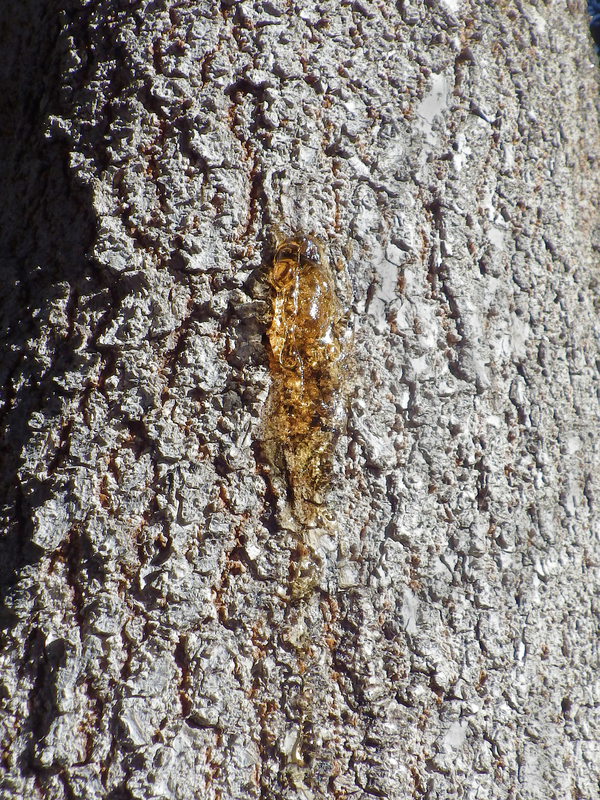 In addition to entry-holes, trees under attack can exhibit a variety of other signs of ISHB/FD infestation, like staining, gumming, presence of frass (thin sawdust), and sugary exudates (see descriptions below). 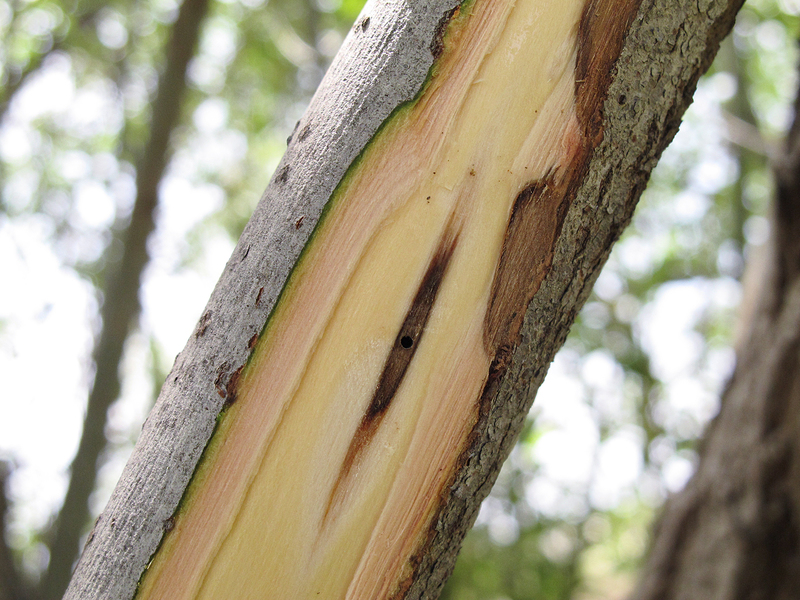 Each tree species react differently to ISHB attacks, so the combination of symptoms can be unique to each host tree species (see the Field Guide to the right for guidance). 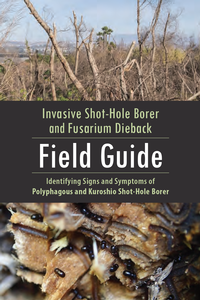 Finally, there are other beetles and disease-causing pathogens that can cause signs similar signs to ISHB/FD; use this lookalike pests guide to help determine if ISHB/FD is a likely cause of the tree’s problems or another pest and/or pathogen may be to blame. Once the correct identification of the problem is made, you can use this handout and this management assessment tool to choose the most appropriate management action. 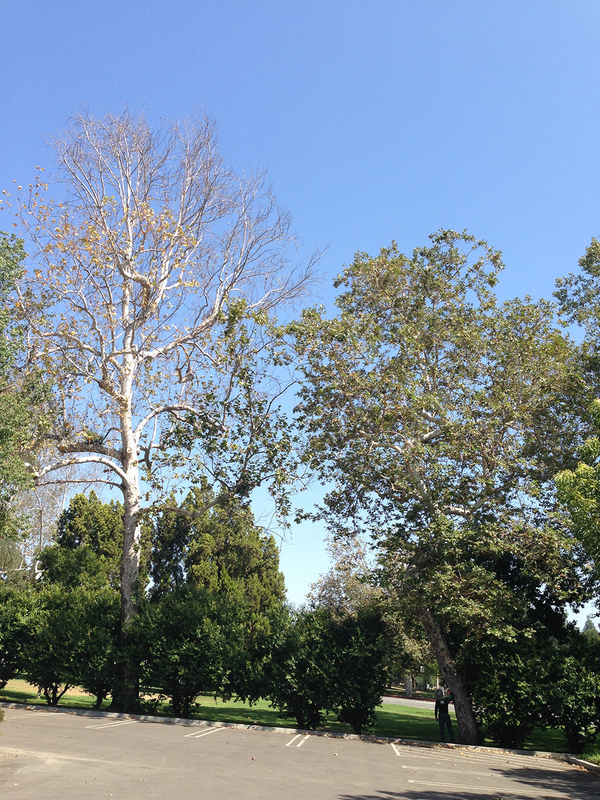 Select a tree to view PSHB symptoms on that species. The typical entry-hole to a PSHB gallery is perfectly round and about 0.85 mm (less than 0.04 inches) in diameter, or about the size of the tip of a ballpoint pen. 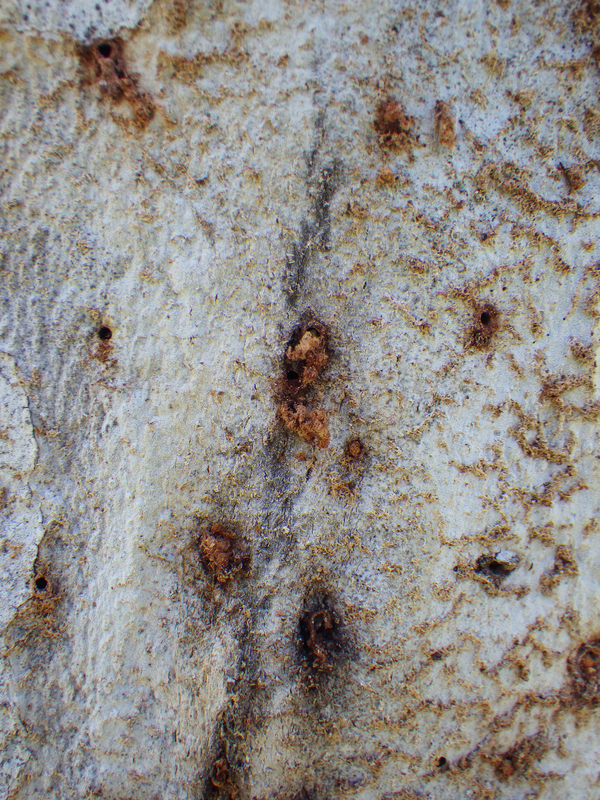 The abdomen of the female beetle can sometimes be seen protruding from the entry-hole. 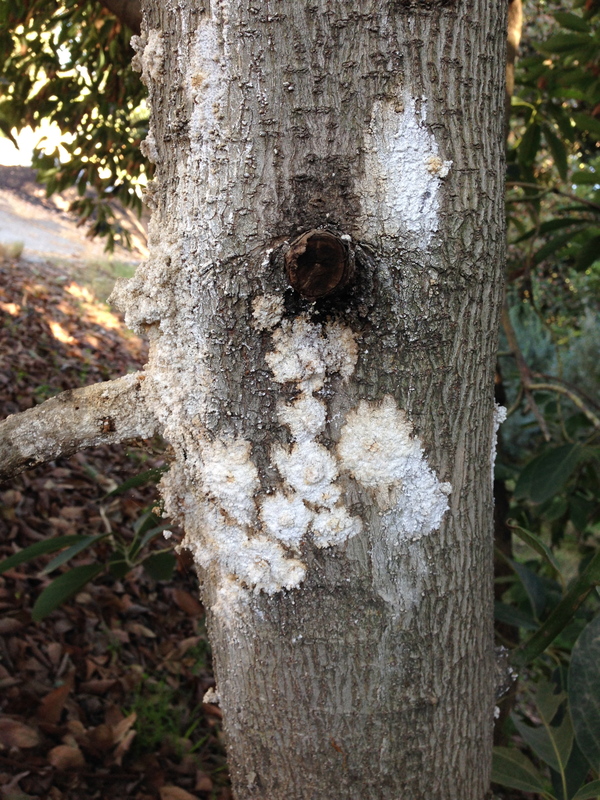 It may also be plugged or covered by sap, exudate, or frass (sawdust from boring) from the tree. 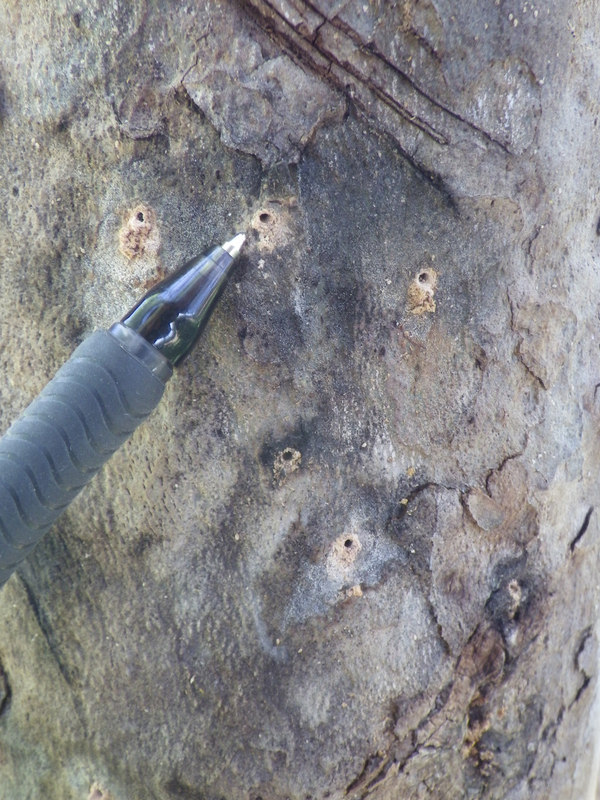 If sending photos to a specialist for identification, include a picture with a pen for scale. 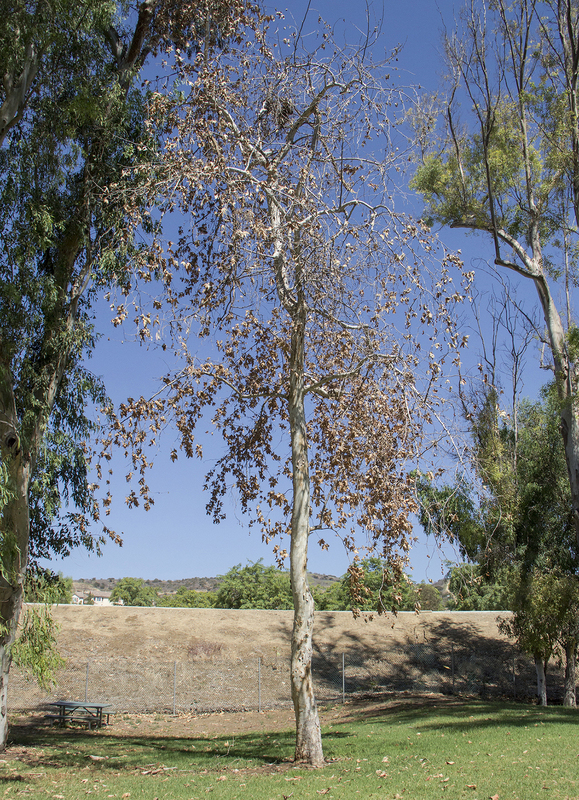 Some of these symptoms may be washed away or obscured by rain or irrigation water. 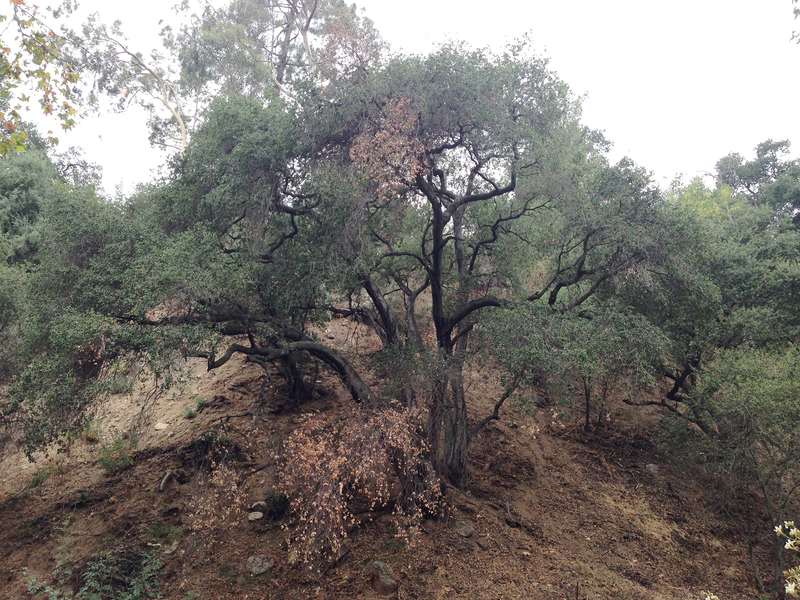 Advanced infestations lead to branch dieback and overall decline. 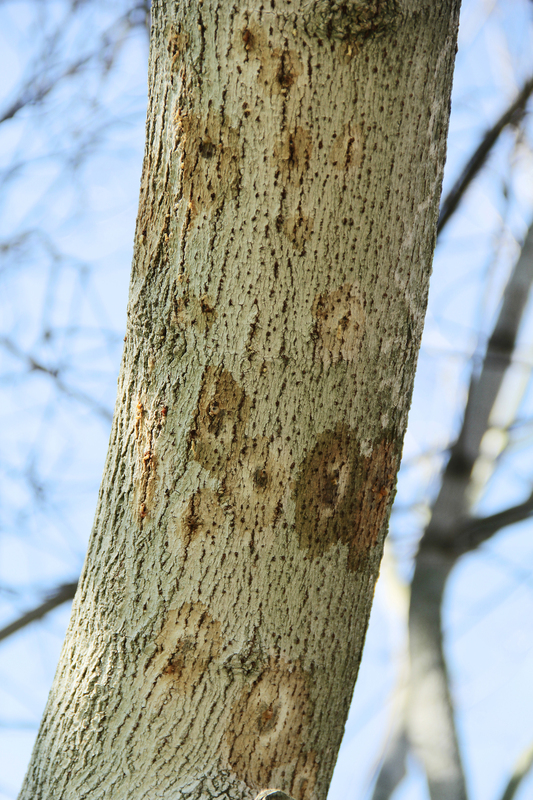 Watch for beetle attacks concentrated on a branch or in the branch collar (the point of attachment between the main trunk and a branch)—infestations in this area can lead to limb failure. 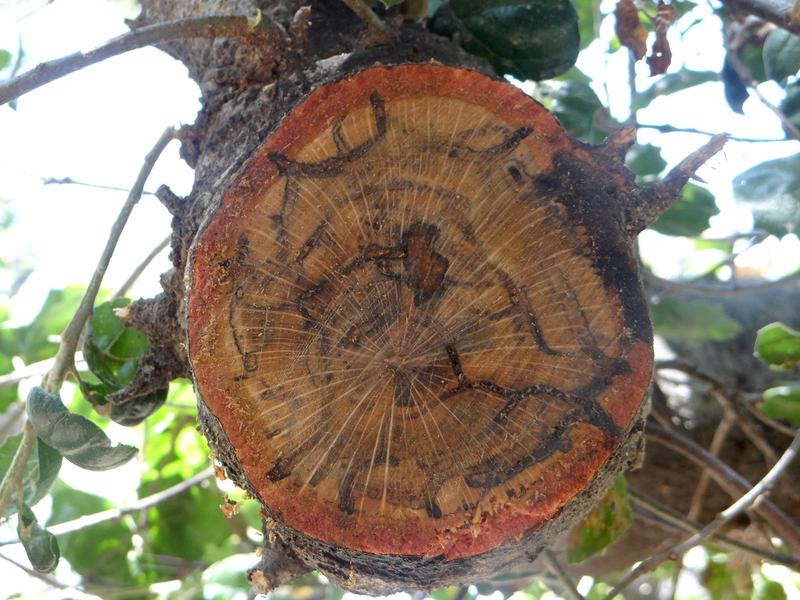 Fusarium causes dark discoloration of the wood beneath the bark and around the beetle gallery. 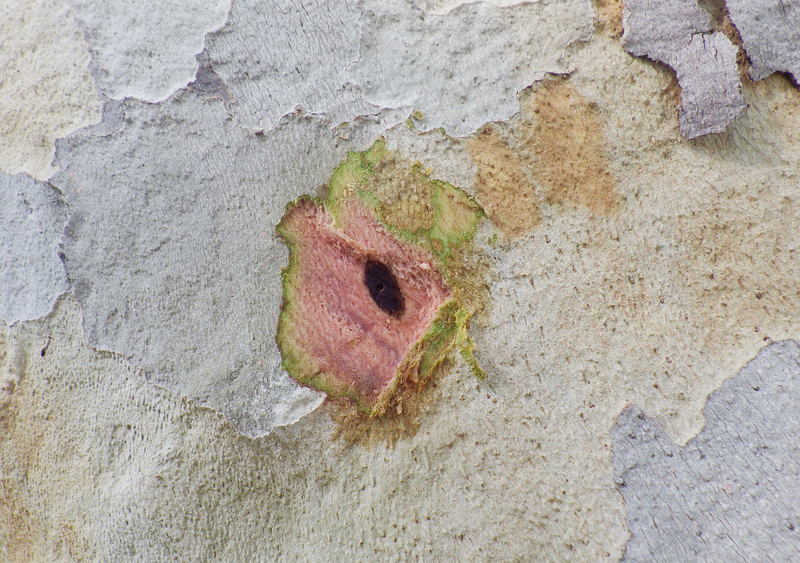 Lightly scraping away the bark around the entry-hole will reveal the dark brown to black staining.